The newest models of Apple and Android devices now allow you to use either Facial Recognition (face ID) or Fingerprint Recognition (fingerprint ID) software to open and access your mobile device or tablet. But did you know you can also use these features to access the BMI Federal Credit Union mobile app? If your device supports these secure features, you will likely already have them installed on your device, and your face or fingerprint ID will be saved into the software. You can then set your device to utilize the service for certain apps. 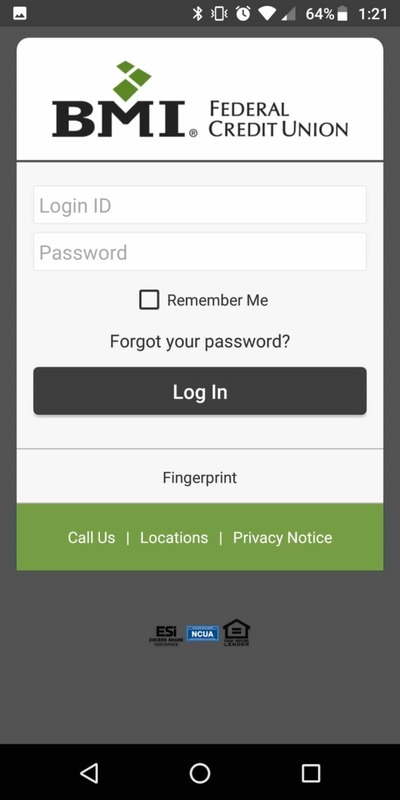 Prior to logging into your BMI FCU mobile app, you will notice the option to select Fingerprint or Face ID (whichever is supported by your device) just below the gray Log In button. Follow the prompts to enable fingerprint or face ID. Your device allows you to select each app for which you'd like to activate this feature. This means that at any time you can turn on or off face or fingerprint ID for your safety. You can find these features under Face ID, Fingerprint ID, or Passcodes in your security settings. Ensure you have enabled the feature for your BMI FCU app. The next time you login to the BMI FCU app, you will be automatically prompted to use your fingerprint or face ID without needing to manually enter your login ID or password! Contact us at 614.707.4000 or visit any of our five branches in Dublin, Columbus or Westerville, Ohio. All services are offered through Apple Inc, Google, LLC and Samsung Electronics Co, Ltd. respectively, and neither service nor support is maintained by BMI Federal Credit Union.